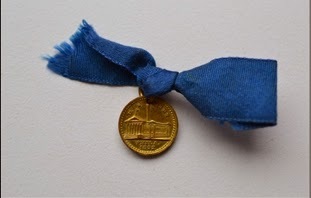 The token is listed in "The Standard Catalog of United States Tokens, 1700-1900" by Russell Rulau. 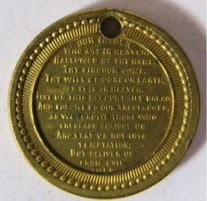 This token is listed by Rulau in the section of Pennsylvania Trade tokens. 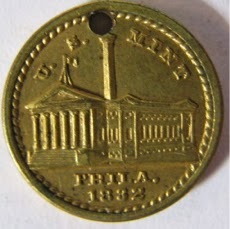 The token was produced by George B. Soley on the Mint's first steam coinage press, which he had acquired as scrap in 1875. Relatively common, extant pieces are available in high grade. It is listed as: PA-Ph 394. Sold at various late 19th century expositions and at the Philadelphia Mint as souvenirs. I was able to confirm that with other research. A coin like this was in the coins I inherited and later sold. They are easy to find and not expensive - $10 to $20 or so (2014). I have one without ribbon which came down in the family. I think it may have come through my great grandmother Anna Cassel nee Traurig. She lived in New York City. Her sister was married in Philadelphia in 1876 and she may have visited the Centenial Exhibition when she went to the wedding. I am not aware of any family members visiting any of the other exhibitions in the late 1800s or early 1900s. Do you know if they were produced in 1876?